Recently added a panoramic view of the arch, here. 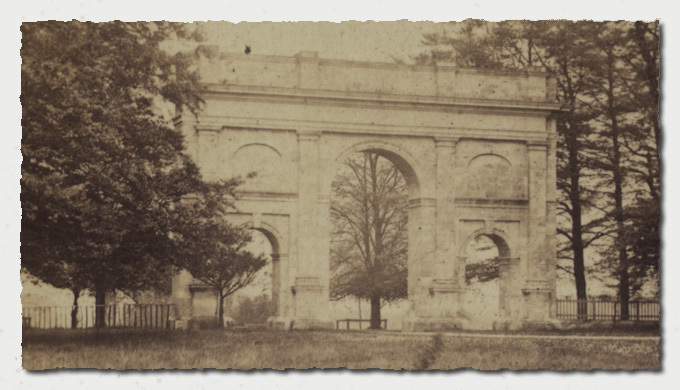 The oldest known photographs of the arch [1 of 2], circa 1860, at that time the structure was approximately 70 years old, it is now more than 220 years old! This photograph is one of the stereo collection available here. The view is looking east towards Aberford and the driveway passes through the centre of the arch. Over the years I have been asked on numerous occasions whether the two oval indentations on each face have ever had some form of molding or decoration, I think this photo answers that question, it was always like it is today! However it has most certainly deteriorated over the years and whilst this picture is rather lacking in detail it does look as if all the cornices and mouldings are very precise, wheras nowadays much of them particularly at the base are heavily weathered. Everyone who knows Parlington is fond of the old arch, but it raises many questions, why was it built? Did the Prince Regent reject the luncheon appointment at Parlington because of the inscription? What was its purpose? Why commemorate the American victory in the war of Independence? View a short movie clip based on a 3D model. Click here [QuickTime, Mac OSX or Win XP] The notes on the right attempt to throw some light on the three questions, Why? When? and Where? The monument is situated to the north of the site of the hall at the end of a delightful beech lined avenue. Sir Thomas Gascoigne had the Arch erected in the late eighteenth century it was commenced in 1781 [see notes on the right]. But when it was completed, along with the inscription is not clear, moreover as the formal end to the war was signed at the Treaty of Paris on September 3rd 1783 it must have been after that date. It was designed by Thomas Leverton and it is believed locally that the arch was to be the entrance to a new house, but as my notes observe this is not necessarily the case. The archives in Leeds have a document attributed to Sir Thomas Gascoigne giving his original inscription for the arch, as follows, To that virtue which for a series of years resisted oppression and by a glorious race rescued its country and millions from slavery , this was too lengthy for the available space and was edited to the inscription you see today. Liberty in N.America Triumphant MDCCLXXXIII and is repeated on both evelations. The Arch is said to be a copy of the Arch Titus in Rome, this is from the Rev. 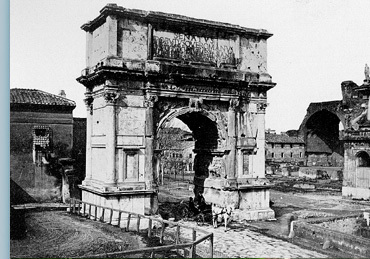 F.S.Colman book mentioned earlier, I rather suspect that the Reverend had not been to Rome, or if he had he had confused the Arch to Titus with the Arch to Constantine, as the latter is structurally similar. 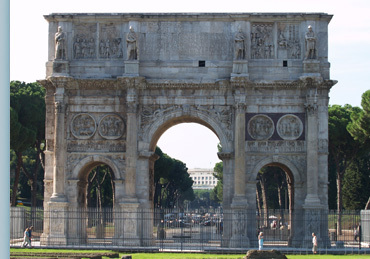 A recent visit to Rome gives me some confidence that if the arch was based on an ancient monument it looks more likely that the arch below commemorating Constantine, adjacent to the Colosseum in Rome, although much more elaborate, seems to be a better fit, than the Titus Arch. A Connection from Gascoigne to the Prince Regent, via Lindley? William Lindley (about 1739 - 1818) is attributed as the architect of the Parlington Round Building or House in 1802-3, often referred to as a Deer Shelter, reference: Landscape Gardens in West Yorkshire by George Sheeran ISBN 0901869325 pages 208 & a picture on 209. An additional reference in the book titled A Biographical Dictionary of British Architects 1600-1840 , by Howard Colvin, in the listing for Lindley on page 620 it states the following: Circular Gothic cattle-shed for Sir Thomas Gascoigne, Bart 1802. Although it states a cattle-shelter, this is the same structure that is also termed as the Deer Shelter in various other references. Sixty years after it was completed, [The Doncaster Mansion House] the ballroom was provided with a companion of equal, and perhaps less awesome elegance. In 1806, a new dining room was designed for the corporation by Lindley, a pupil of the celebrated John Carr of York, he had moved to Doncaster by 1783, where he carried on a thriving local architectural practice. It seems likely that the new dining room was inspired by the wish to present the best possible image of the town for the visit of the Prince Regent (the future George IV) and his brother, the duke of Clarence (the future William IV) to the Doncaster races in 1806. They stayed with Lindley in his house on South Parade. Given the importance of racing to the town, it is natural that the royal visit should prompt a major improvement in the facilities available in the town's most important building, (Doncaster Mansion House), to which Lindley made important changes. The exterior of the building does not now have the appearance that Paine (original architect) intended for it. The original design was topped by a giant triangular pediment, spanning the entire facade. This was replaced in 1801 by the present parapet to a design by William Lindley. The parapet has three windows, but all of them are blind; behind them is the original roof designed by Paine to fit with his pediment. Given that Sir Thomas Gascoigne was a great patron of the Turf and an acknowledged race horse owner and won many races including the following more significant: St Ledger 1778, with Hollandaise; again in 1798 with Symmetry; the Oaks at Epsom in 1803 with Theophania; and the Doncaster Cup with Tuberose in 1776. All Sir Thomas's horses would have been trained at Parlington, sending them two weeks or so prior to a race, to local training stables. It is most likely that Lindley would have introduced local dignitaries to the Prince Regent and his brother the Duke of Clarence, on his visit to Doncaster in 1806. Sir Thomas would have been an obvious introduction, with his keen interest in racing and having won the St Ledger twice. Did Sir Thomas invite the Prince to Parlington, never thinking of the inscription as an insult to George III? A number of factors should be considered about the location of the new house and the Triumphal Arch. Sir Thomas Gascoigne was married on 4th November 1784 to Mary, daughter of James Shuttleworth, sadly within two years, on the 1st February 1786 his wife died aged only 34, a month after the birth of their only son Thomas Charles (Tom). That Sir Thomas was considering a new house is evidenced by the numerous proposal drawings in the West Yorkshire Archives, however his position was dramatically changed following the untimely death of his wife. From information found in a book by the Rev. F.S Colman Rector of Barwick in Elmet, published by the Thoresby Society in 1908, the following: There is a tradition that the stone of which the arch was built was brought there for the purpose of building a new house on the hill above the old hall and Sir Thomas having relinquished his idea utilized the materials in erecting what he considered a worthy memorial. It seems reasonable to believe that the Triumphal Arch is a statement of how Sir Thomas felt, given his strong feelings and approval of the American cause in the War of Independance and following the death of his wife. In his changed circumstances the idea of building a grand house, would seem in the authors opinion, unlikely. From the earlier observations it may be that the Arch was undertaken after the death of Sir Thomas's wife in 1786. From the book A biographical dictionary of British architects, 1600-1840 By Howard Colvin, Paul Mellon Centre for Studies in British Art on page 648 describes the building of the Triumphal Arch at Parlington, as now building in 1781. This may answer the WHEN? The third point, [where] is associated with changed circumstances Sir Thomas found himself in following the death of his wife. If he had intended to construct his new home as is believed at the top of the hill, then at the time he relinquished the idea, a large amount of stone from the quarry would have been assembled there, so it became the obvious choice for the arch, as there was little point in moving it to another location. This may answer the WHERE? Pictures from earlier versions of the site are denoted by the border effects, as seen in the two arch pictures on the left. A useful reference to the Arch of Constantine in Rome.